The Supreme Court’s ruling that the SEC’s in-house judges are constitutional officers left open the status of 1,900 other officials in similar roles at agencies including the Federal Energy Regulatory Commission, National Labor Relations Board, and the Environmental Protection Agency. The Securities and Exchange Commission’s five administrative law judges are constitutional officers because they’re continuing employees who wield significant authority, the U.S. Supreme Court held June 21 in a 7-2 decision. The “sole question” in the case was about whether SEC judges were lawfully appointed, leaving open the status of ALJs at other agencies. Justice Elena Kagan wrote the majority opinion.Hundreds of other administrative law judges serve throughout the federal government, including more than 1,600 at the Social Security Administration, 34 at the NLRB, 13 at FERC, 12 at the Occupational Safety and Health Review Commission, and three at the EPA. Much could depend on how similarly other agencies treat their ALJs and the decisions they render to the SEC’s approach. “It’s going to depend on whether other agencies follow the SEC practice of adopting the ALJs’ decision as their own,” Sidney Shapiro, an administrative law professor at the Wake Forest University School of Law, told Bloomberg Law. If the agency head issued a separate opinion, the way he or she treated the ALJ’s opinion would probably have a bearing on how the decision affects other agencies, he said. A 1991 ruling that tax judges are officers because of their significant authority controls this decision, the court said. The tax judges in Freytag v. Commissioner were “near-carbon copies” of the SEC ALJs, she said. Like the tax judges, SEC judges serve on a continuous basis and exercise significant authority, even though the SEC itself can overrule their decisions. “In many agencies, the decision of the ALJ has no legal effect, it just constitutes a recommendation to the head of the agency,” Shapiro, the administrative law scholar, said. Officer status might “depend on whether other agencies follow the SEC practice of adopting the ALJs decision as their own,” he said. 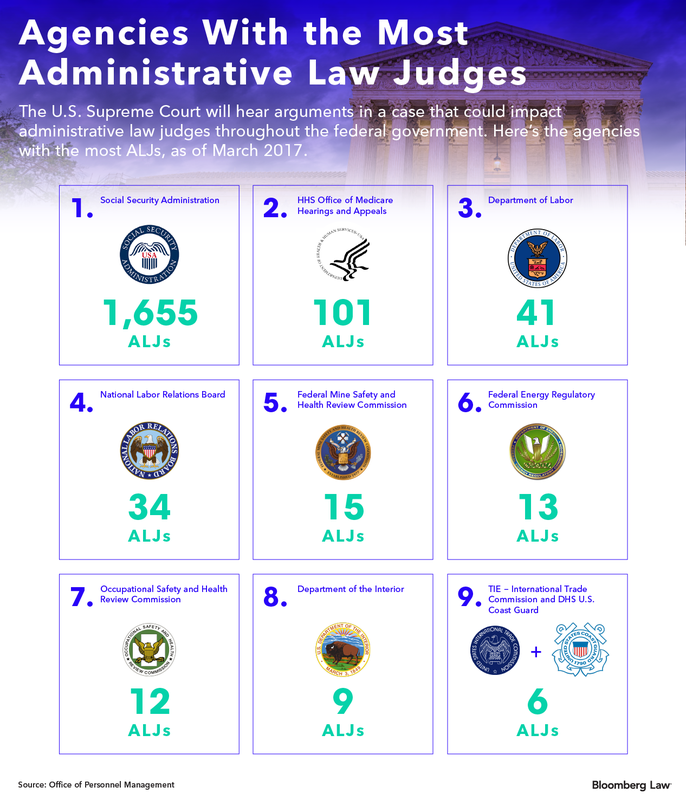 Several agencies have already seen challenges to the constitutionality of their ALJs’ appointments, including the Consumer Financial Protection Bureau, NLRB, and Social Security Administration. These challenges will be “the next battleground,” Scott Witlin, a labor and employment partner in Barnes & Thornburg LLP’s Los Angeles office, told Bloomberg Law. Witlin currently has a pending motion challenging the appointments of the NLRB’s in-house judges. The Appointments Clause allows department heads to appoint officers, and “by statute, most of the independent agencies are not departments,” Witlin said. “There’ll probably be a fight over whether agencies like the NLRB are departments” entitled to appoint their own ALJs. The government’s brief suggested FERC judges were “appointed in the same manner as the SEC ALJs,” William Scherman, a partner in Gibson, Dunn & Crutcher LLP’s Washington office, told Bloomberg Law. The ruling “raises substantial questions about whether the FERC’s ALJs are properly appointed.” Gibson, Dunn & Crutcher LLP partner Mark Perry represented Lucia. Agencies reviewing the fact-specific decision need to “ask themselves, ‘what have we done and is there something we can do now to fix an actual problem or take a debatable problem off the table?’” Jonathan Shapiro, a partner in Baker Botts LLP’s San Francisco office, told Bloomberg Law. There’s “no reason to doubt” that ALJs like the ones at the SEC “couldn’t find themselves in these jobs through top-shelf constitutional appointments,” he said. Some federal agencies had already taken action in anticipation of a Supreme Court ruling against the SEC. Labor Secretary Alexander Acosta in December ratified the Labor Department’s ALJs. The ratification is intended to “address any claim that administrative proceedings pending before, or presided over by” the DOL’s judges violate the Appointments Clause, Acosta wrote. The decision is “sort of lukewarm” on using ratification as a means to “cure” constitutional defects, Nick Morgan, a partner in Paul Hastings LLP’s Los Angeles office, told Bloomberg Law. Ratification is mentioned primarily in a footnote, and the court didn’t “condemn” or “endorse” it. Other agencies “shouldn’t take any comfort from this footnote that ratification is the way to go,” he said. Other agencies didn’t need to take any special steps because their department heads already appointed their ALJs as a matter of course. Because Occupational Safety and Health Review Commission judges are already “appointed by the head of the department, there shouldn’t be any effect” on that agency, Steve Simko, of counsel in Constangy Brooks, Smith & Prophete LLP’s Atlanta office, told Bloomberg Law. Simko previously spent 15 years as an OSHRC judge. Another federal agency that should come out of the Lucia decision relatively unscathed is the CFPB. The Dodd-Frank Act, which created the CFPB, mandated that the bureau’s director appoint all of its administrative law judges, so those should be safe under the Supreme Court’s new standard. However, the CFPB sometimes uses ALJs from other agencies, including the SEC, and those judges’ appointments could become an issue. In a twist, the ALJ at the center of the Lucia case, Cameron Elliott, has previously heard cases while on loan to the CFPB. The EPA has three administrative law judges, which decide enforcement and permit proceedings and hearings brought by the EPA’s Office of Civil Rights. The effect on these judges is unclear, but the agency “is aware of the decision and reviewing what impact it has for the agency,” an EPA spokesperson told Bloomberg Environment. The controversy reached the high court after investment adviser Raymond J. Lucia sought to overturn an SEC ALJ decision barring him from the industry. The judgment against him couldn’t stand because the ALJ who issued it hadn’t been appointed in the manner prescribed by the Constitution, Lucia said.The SEC defended its appointment process—having its chief ALJ select new ALJs from a list curated by the Office of Personnel Management—twice at the U.S. Court of Appeals for the D.C. Circuit. The government changed its position in November 2017, agreeing that ALJs were constitutional officers who needed to be appointed by the head of the agency. The SEC then ratified its ALJs’ appointments and directed them to reconsider past decisions in pending cases.Because Lucia made a timely objection to the constitutional validity of the ALJ’s appointment in his case, he’s entitled to relief, the court said. The appropriate remedy is a new hearing before another SEC ALJ or the five SEC commissioners. The SEC was already set up in a manner allowing the full commission to hear appeals of ALJ decisions, but other agencies might not “be able to handle that kind of thing,” Morgan said. Because the court didn’t decide whether the SEC’s November 2017 ratification was an acceptable cure, “it’s possible that hearings that occurred after that ratification date will also have to be reheard before properly appointed ALJs,” David Kornblau, a partner in Covington & Burling LLP’s New York office, told Bloomberg Law. The court was clear that any challenges to the constitutionality of appointments must be timely, meaning that “cases that had become final will probably be immune to an effort to reopen them,” Kornblau said. The case is Lucia v. SEC , U.S., No. 17-130, decided 6/21/18 . With assistance from Fatima Hussein, Rebecca Kern, Abby Smith, and Evan Weinberger.